A Crisis Called New York presented by Step 1 Theatre Project is part of the Frigid Festival at Kraine Theater. 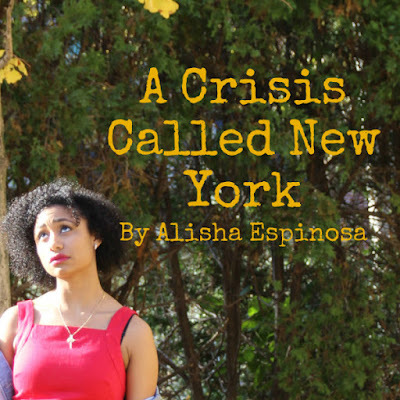 Written by Alisha Espinoza, the play starts off with a woman, Nicolasa played by Kristi Stout, and her presumably man friend, James played by Tony Curtis. James had fallen in love and Nico simply won't let herself be hurt again. From there several love stories occur all taking place in the city of New York. A bit mistitled, A Crisis Called New York really had nothing to do with the city or didn't portray as such. The show could have taken place in any Metropolis, therefore missing the mark on identifying why the people and their lives were connected to NYC at all. The show really had to do with love. How some can live without it, how some crave it, how some run from it, and so on. Each couple had a unique aspect and outlook on love. Directed by Benjamin Abraham, Ben tried to capture ones need for love no matter what they might think they need. He did an excellent job at building each actor in these relationships, the director/actor work was very clear and shinned brightly on stage. Olivia Rubano choreographed this piece. That is right... there is dancing. For some stories music was being sung as each couple took the stage to portray their love through dance; one was sweet, one was dangerous, and one was pure lust. Olivia and Benjamin did a nice job collaborating. The dance pieces felt a part of the show and blended well. The couple that wins the best chemistry award goes to Sara and Vic, played by Danielle Patlingrao and Jordan Schroeder. Both actors had an ease and natural ability on stage with one another and with the other ensemble as well. They brought themselves into these characters. The entire ensemble deserves a congrats though. It is not an easy thing to get up on stage and portray the most intimate portions of a relationship, good and bad. Over all, A Crisis Called New York is mistitled, a bit unconnected, but has a lot of heart. The concept is interesting, it was just a shame that none of the stories seemed to connect to one another. It was unclear when an actor took the stage again with new person if they were playing the same character or if they were a new character from another relationship. This could have easily been solved in the writing process. It was many interesting stories that had nowhere to go because of the lack of written connection, they simply ended. If this play is produced again it would be wonderful to explore how each couple could connect through the city they are in. A few more drafts and A Crisis Called New York would reach its potential.